Writing is one of the most common tasks we do in our professional careers. Whether we’re writing a blog post, answering an email, sending a newsletter, or even writing a novel, writing is a slow process. Even for those who type fast, they can usually talk faster than they can type. Fortunately, you can speed up the writing process by using speech to text software. Many find that software helps them silence their internal editor so they can focus on writing now and editing later. Speech to text software is also great for those who have difficulty using their hands, have dyslexia, etc. In this article, we’ll look at the 10 best speech to text tools to speed up your writing process. These apps have a high rate of accuracy of usually around 90% or higher. Prices range from free to hundreds of dollars, so there should be something here for every need and budget. The apps are in no particular order. Google Docs Voice to Text works with Chrome browsers when using Google Docs or Google Slides. It’s available in lots of languages. You can add punctuation by saying the name of the punctuation you want to use. It also has voice commands to select, format, edit, add tables, move around the documents, stop or start, open help, and accessibility. It includes a help file with the instructions and all of the commands. 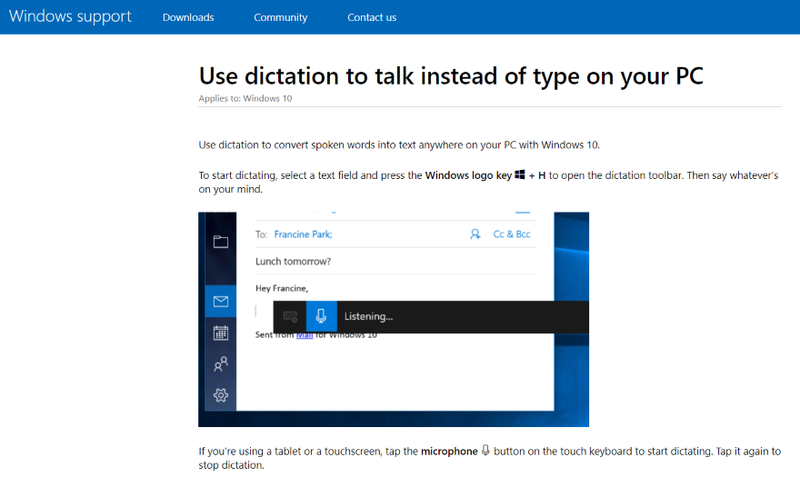 Windows Dictation is built into Windows 10. I typed this line with Windows 10 dictation. You have to initialize it, open it, and select the microphone icon, but then it types what you say at the location of your cursor. It works with documents, social media, email, etc. I placed my cursor in the address bar and said “Google dot com, enter” and I was taken to Google. I’ll have to spend some more time with it and learn the commands. The help file includes a list of commands and instructions for typing punctuation, numbers, symbols, and letters. It’s only available in English. 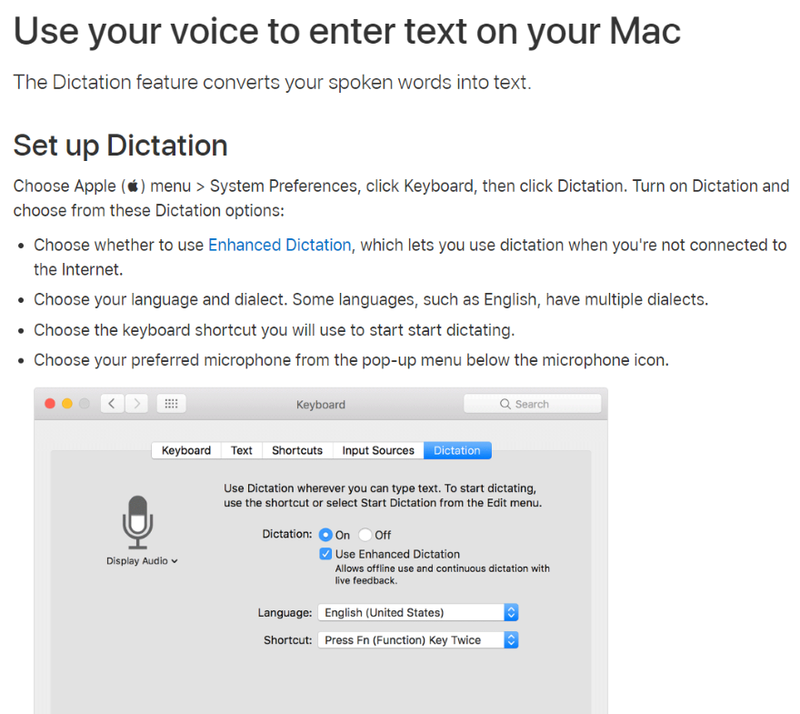 Apple Dictation is built into Mac, but it has to be turned on and enabled. Siri can do this for you (just say “turn on Dictation”). It has multiple languages and dialects. It has an enhanced mode that works without being connected to the Internet. The help file includes instructions for punctuation, characters, and formatting. It will type wherever you’ve placed your cursor, so it’s great for word processors. It also adapts to your accent. Dragon is probably the most well-known name in speech to text software. Dragon Professional Individual was designed specifically for business and professional writing. It syncs with the mobile app, Dragon Anywhere. It does dictation and transcription. It has Deep Learning so it can adapt to your voice and environment. It’s customizable and includes voice commands, editing, and it’s compatible with lots of applications. It works with Windows 7-10, but there are versions of Dragon available for Mac. There’s also a home version available for half the price. Braina is a personal and office productivity application that’s available in both a free and a pro edition. The Pro edition of Braina includes a speech to text feature along with many other features to control your computer with your voice from anywhere in your house or over a Wi-Fi network. It includes over 100 languages. 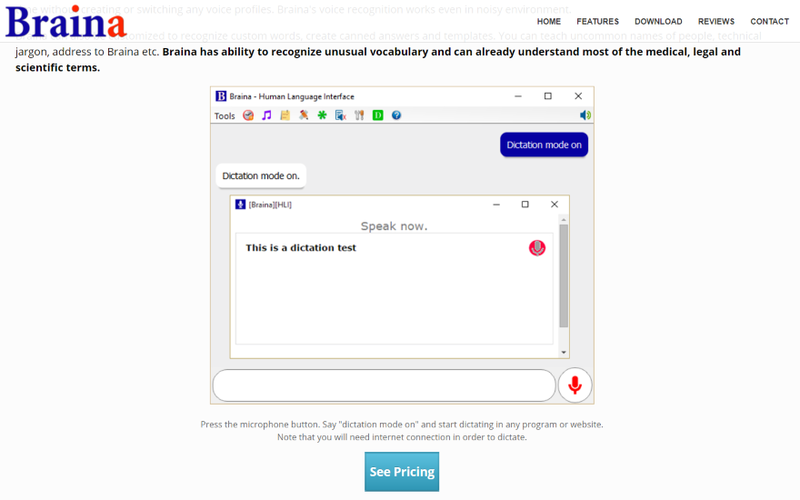 It converts voice into text with any website or application such as Word, Notepad, etc., and includes dictation commands. It’s available for Windows. Speechnotes is an online notepad that takes dictation. It will also read your writing back to you. It only works with Google Chrome. It includes punctuation and formatting. It auto-saves your work as you go. You can store it within folders, download, email, save as a Word document or a text file, upload to your Google Drive, and copy it to your clipboard. It works with 10 different languages. It also has a premium extension for Google Chrome that adds a few simple features such as word count and a quick access button to your Chrome bar. Dictation is an online app that works with Google Chrome. It stores the text in your browser, so nothing is uploaded to any website. It records the writing within a text editor and includes some rich text formatting options. It works with lots of languages. You can copy, save as plain text, publish, tweet, play the text as speech, email, and print your text. It includes commands for smileys, special characters, punctuation, quotes, and brackets. It also has a list of phrases to perform certain commands. Speech Texter is an online app for Chrome that includes lots of formatting options. It has a custom dictionary with short commands to enter data such as punctuation, phone numbers, addresses, etc., and you can add your own commands. It supports over 60 languages with 90% accuracy for most languages and 95% accuracy for English. You can download your file as text or a Word document, or you can print it. 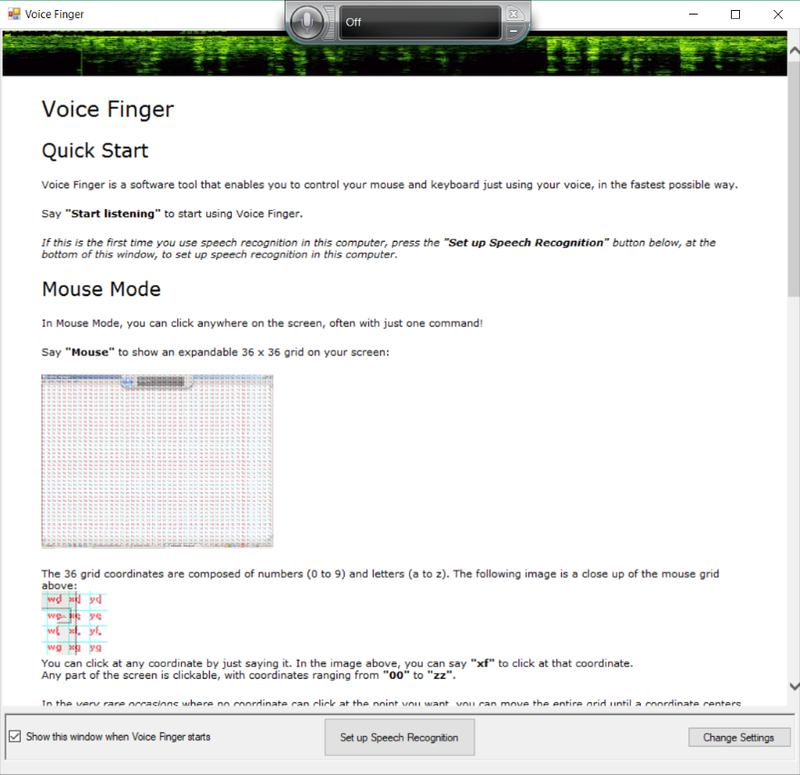 Voice Finger allows you to control your Windows PC vocally and includes a dictation feature. Open your document in any editor, turn on the dictation features, and start talking. This disables the keyboard and mouse by default, but you can turn them back on again with voice commands. You have control over the settings and you can tune it to your voice. e-Speaking is a Windows app that lets you control your PC with 100 built-in voice commands. Its speech to text feature lets you write in any text editor with 26 commands for dictation, navigation, edit the text, add formatting, and add punctuation, numbers, symbols, etc. It includes the list of commands and you can add your own or edit them, and train words so the program responds better to your voice. That’s our look at the 10 best speech to text tools to speed up your writing process. Some work in your browser and provide a simple editor while others work within your operating system and allow you to write with your favorite word processing software. Whether you’re writing a blog post or the next big novel, if you’re interested in speeding up your writing process with speech to text tools then you’re sure to find what you need on this list. We want to hear from you. Have you used any of the speech to text tools in this list? Let us know what you think about them in the comments. The post 10 Best Speech to Text Tools to Speed Up Your Writing Process appeared first on Elegant Themes Blog.